We have done some major changes in the way TDM is built, changing toolsets, third-party libraries, etc. It would be great to check that the new build still works on old Windows and some Linuxes. 1) Backup your TDM 2.07 installation. 2) Download several files (exe/pk4) to TDM installation directory (replacing whatever is there). 3) Start TDM game, open console and verify that number 8165 is present in the lower-right corner. 4) While in-game, check that you can download some FM, can start some mission, cinematics play, save/load works (with correct savegame preview screenshots). 5) Start tdm_update and let it go (it will downgrade back to official TDM 2.07). No in-depth testing is required: it is just a brief check that it does not crash on start / on first use of some library. I'd be happy to try again but I can't promise that the results will reveal a OS problem or if it will be from some sort of other problem like for example, a ATI Radeon HD 5450 problem. I downloaded TDM and everything went splendidly but then when it tried to download Microsoft Visual C++, the program stalled and then it froze - no joy for me. Edited by Jetrell, 11 April 2019 - 02:12 PM. I have 2 old laptop I could put vista on to test this, or failing that a VM. I have added the link in the original post. You can kill tdm_update process when it tries to install VC redist. The testing package does not need it. Hm... i had a similar issue when i last did a update with the TDM Updater. 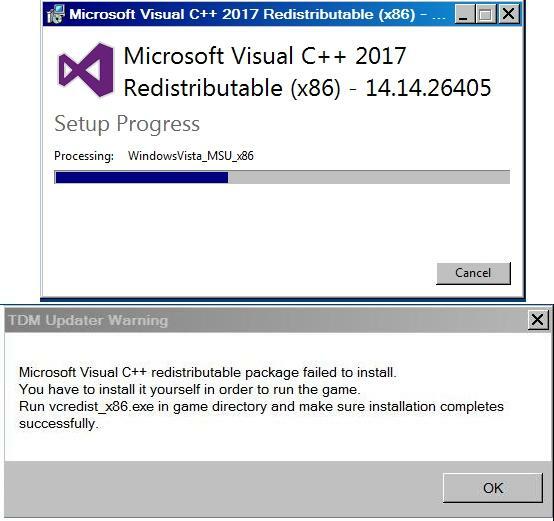 It told me it installed VC Redist, but then said it couldn't be installed, and, when i tried to manually install it, from the TDM folder, it told me that it is already installed, or a newer version is installed, or something similar. Thanks for the link, I used it and got TDM to work, which was a big and happy surprise. I started the Training Mission, A New Job, and Tears of St. Lucia. I had terrible video distortions but I'm certain that has nothing to do with TDM and everything to do with my old and sad video card but as a result I was only able to skim through the maps. While in-game, everything seemed to work just fine, missions started, cinematics played, save/load worked. I had a crash but again, I'm certain it was my video card's fault. I tried "Start tdm_update" but it didn't work and I got this instead. I'll have to define PSAPI_VERSION to workaround it (as described here). I will create a new build, but a bit later. I'm afraid 2.07-hotfix needs attention this weekend. Edited by lowenz, 13 April 2019 - 03:49 AM. Tested on a vm with opensuse 15.0 leap 64 bit. That version of the TDM-Updater 64bit work great and TDM starts. couldnt test the other things, because TDM runs very slow on a vm. Edited by freyk, 13 April 2019 - 10:47 AM. This is in no way 2.08 beta. I simply build some TDM binaries and kindly ask players to test them. This thread will go down by itself after a week or so, I guess. Please download new version, and overwrite all the stuff with its contents. This will be a good test case. I downloaded the new version but sadly there was still no joy. This is what happened, after the TDM download, it told me that I needed to install VC myself which I did but the download froze. The build being tested does not need redistributable, so I will remove this part from tdm_update. The main thing is that the updater started, downloaded a bit of files, and finished properly (aside from this warning). Right? I wish to hear some more feedback from testers with Linux. In the meantime, if someone takes time to briefly test this on Windows 7 --- that would be helpful (just to be sure). Never got to do this ever thew weekend, so will try and do it this evening. So my old spare Dell D630 is quite dead, so I am doing a vbox install and will see how it goes. I think virtualbox is overkill. Better wait for someone who already has the setup for proper testing. VMPlayer is already better than Virtualbox (gamer use case). Sorry for the delay, RL got in the way. Tested it today (Manjaro Linux 64bit with latest packages). Downloaded the files, copied them over, started the game, all fine (version number in console is 8165). Save/load works, get a low-res screenshot, too. Downloaded a FM (and installed/started it), check. Finished with starting the updater, which apparently worked without any issues.